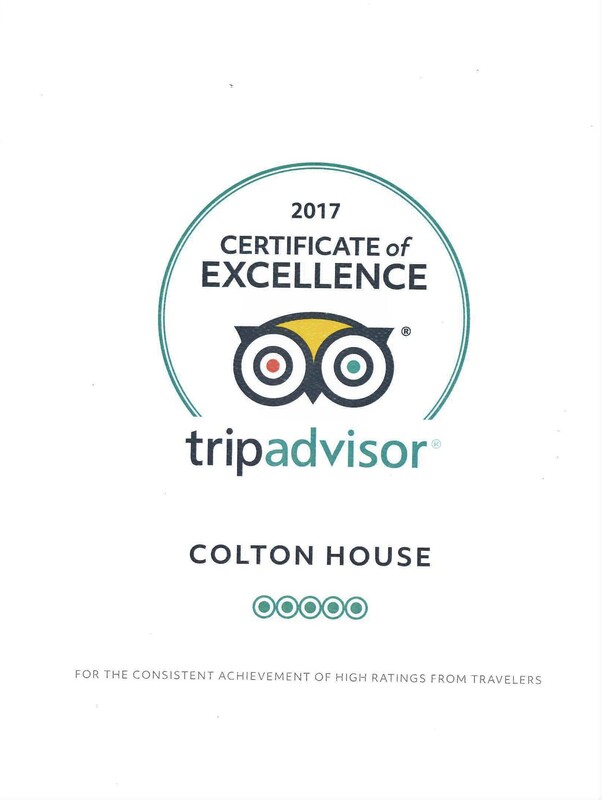 Colton House is proud to have achieved a five-star rating from VisitEngland and a Gold Award for Excellence, as well as an Award for breakfasts. Being passionate about sustainability, we are delighted to have won the Best Sustainable Business in Staffordshire for five years and have awards from the national body of VisitEngland at Highly Commended and at Bronze level. Winner of The Best Guest Accommodation in England at the prestigious National VisitEngland Awards for Excellence 2015 Ceremony. This is the most closely fought category that there is in the competition. Commenting on the Award, James Berresford, VisitEngland’s Chief Executive said “It is a great achievement to win a Gold Award in a field of very high quality applications. 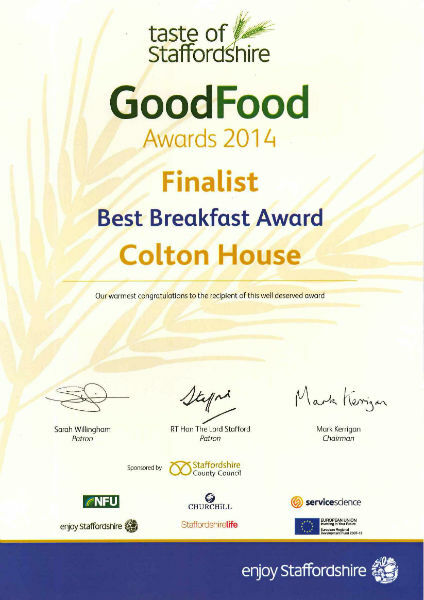 The Award places Colton House at the top for excellence in England. 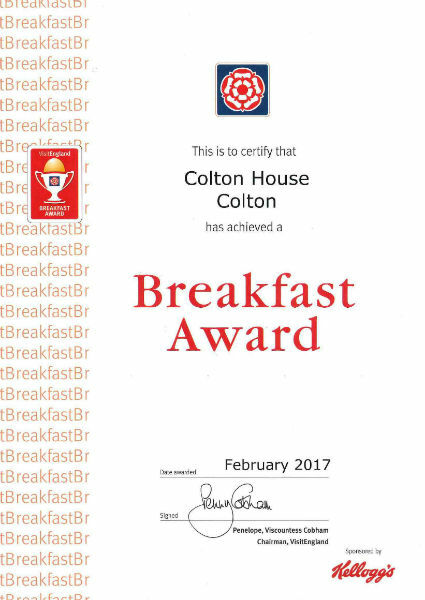 I warmly congratulate them on this achievement, to note Colton House is in the shortlist in two categories is a major achievement”. 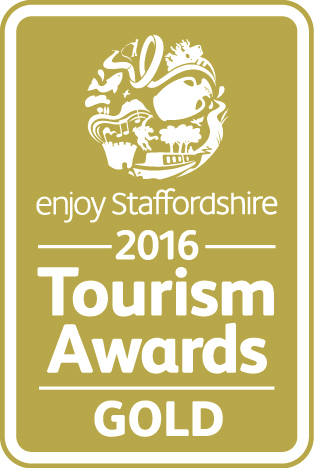 We have won this award for the last five years and since the start of Staffordshire’s own awarding process. 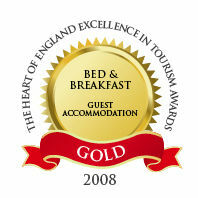 Recently the category broadened to encompass all types and styles of serviced accommodation. It might be a Restaurant with Rooms, Pub with Rooms, a Limited Service Hotel, Boutique B&B, Guest House, Town House or ‘Room Only’ accommodation. The properties could be of all sizes and styles. Assessed in a wide number of areas such as commitment to delivering excellent customer service, training and skills for employees, sustainability dedication to best practice, quality of service and product. Also why it stands out from the crowd with innovation and creativity. Any business that offers a high quality experience to the business visitor and/or generates tourism through staging high quality business events such as meetings and conferences. 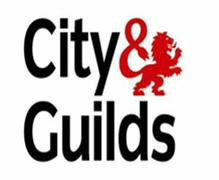 In addition we did well on being proactive and dedicated to best practice, with a high quality of service and product. We are delighted that we beat Alton Towers! 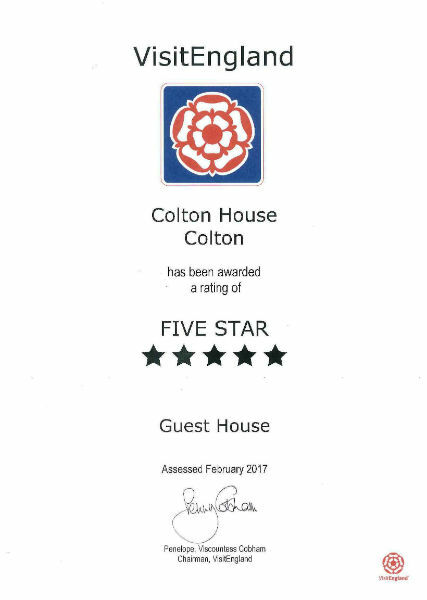 Colton House holds a five star guest accommodation certification from Visit England, demonstrating its excellence in all areas. The national assessing bodies (Visit England, Visit Scotland, Visit Wales and the AA), now all assess guest accommodation to the same criteria and award a rating of one to five stars based on overall performance and quality. Always look for the Quality Rose, the official mark of the Visit England national tourist board rating scheme, when you are choosing your accommodation. 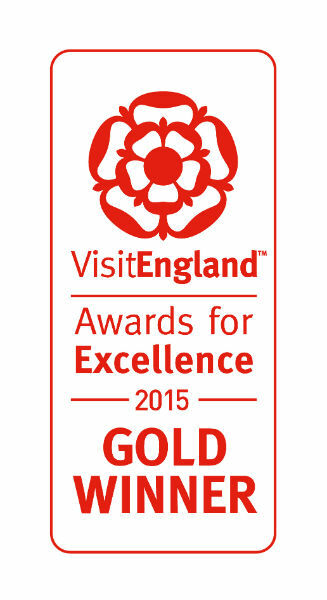 Visit England’s Gold and Silver Awards are given to guest accommodation which performs exceptionally well within, or outperforms its star rating. These awards are based on outstanding quality within five areas: housekeeping, hospitality, bedrooms, bathrooms, breakfast. This award, sponsored by Kellogg’s, recognises accommodation which provides a breakfast and service of quality which exceeds the property’s star rating. We have held this award since 2009. We were marked on our commitment to delivering excellent customer service, training and skills for employees, sustainability and environment; along with our proactivity and dedication to best practice, quality of service and product. 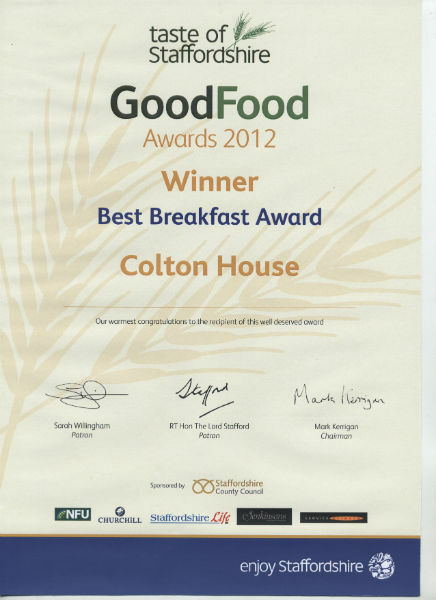 Unfortunatly the ‘Best Breakfast Award competition has been discontinued. 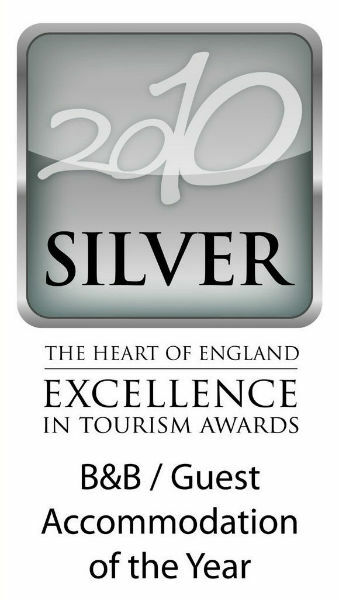 Winners of a Silver at the Heart of England Awards for Tourism Excellence in the B&B and Guest Accommodation category. This very large area covers Gloucestershire, Herefordshire, Worcestershire, Shropshire, Staffordshire, Warwickshire, Birmingham, West Midlands, Coventry and the Black Country. 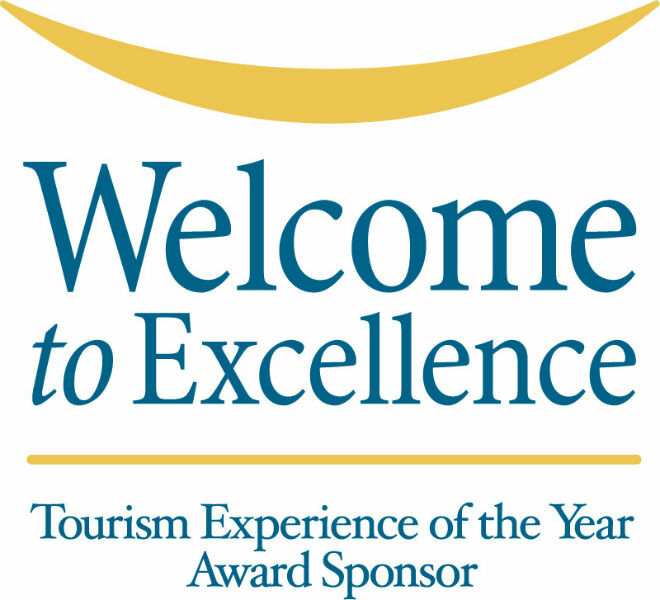 All of the team have undertaken courses and won awards from Welcome to Excellence which recognises our completion of a customer service training programme and a commitment to delivering the highest standards of customer service. The Heart of England Excellence in Tourism award area covers Gloucestershire, Herefordshire, Worcestershire, Shropshire, Staffordshire, Warwickshire, Birmingham, West Midlands, Coventry and the Black Country. In association with the national Enjoy England Awards for Excellence, these highly coveted awards recognise the quality, innovation and dedication of tourism providers across the region. 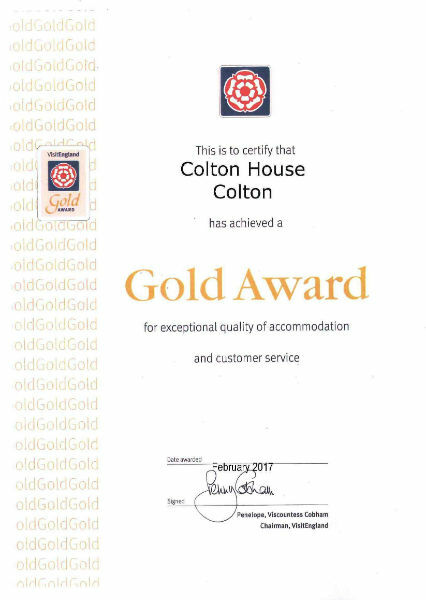 Colton House was the first accommodation provider in the Heart of England Region to gain a Servicemark Gold award. The award is given for outstanding excellence and leadership in customer service. The team have awards for awareness of drugs in the licensed retail sector.